Childhood was a time of wonder; the world was magical and full of surprises. Memories of childhood activities, the games, the pranks, and the friends you played with, stay with you forever. The excitements that come with reliving childhood memories are oftentimes effortless and they touch you deeper than any of the things you have taken up as an adult. No matter how old you’ve grown, or how independent you’ve become, the child in you leaps at every opportunity to engage with the things that defined your childhood; and on Maliyo app store you can find a collection of exciting games to satisfy your childhood Nostalgia. MONKEY BANANA: You can relive the childhood wonder and the Monkey Banana chant at the sight of a monkey hopping about behind the carriage of Lorries. 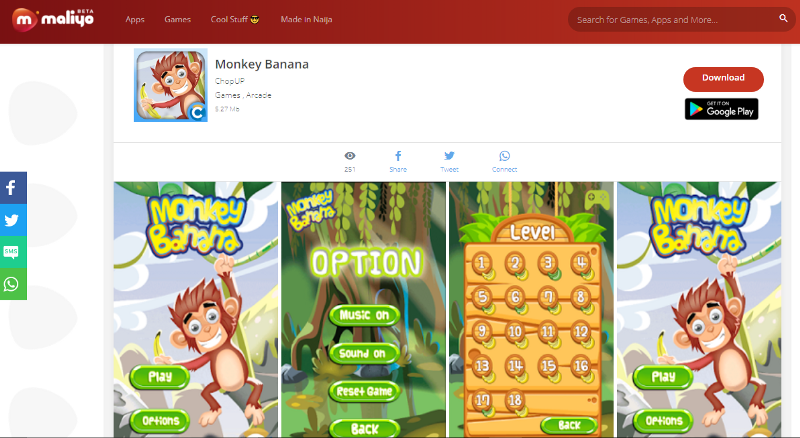 This App is one of the exciting games in the arcade category where you help Bobo the friendly monkey, who is hungry to bring down as many bananas as possible. Think up means to solve the mystery of the hanging bananas in this challenging and fun-filled game. This game takes you through 18 thrilling stages. MONKEY POST: Yes, you grew up and found out its Monkey post, but then this realization cannot dampen the childhood memory of the thrills and emotions which came with playing this game. The MONKEY POST App comes with limited football rules; No throw-ins, no penalties, no red-cards, no corner-kicks, just football, and goals. Lots of goals! It comes with a great user interface and user experience with realistic arcade sounds, 4 player levels, where each level determines the strength of player’s team. 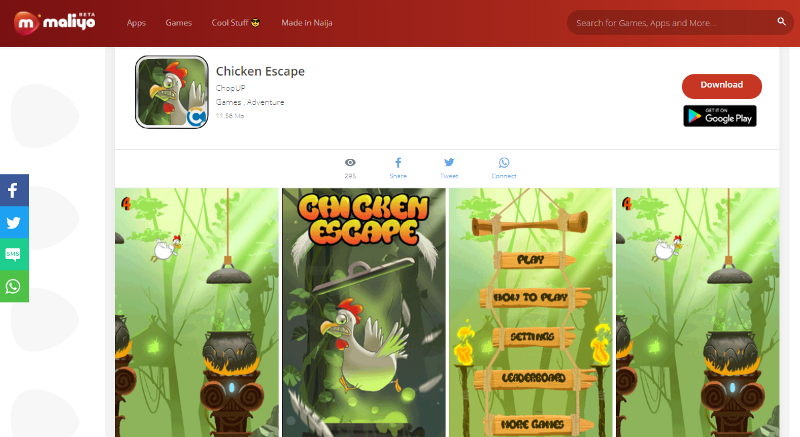 CHICKEN ESCAPE: You can relive all the excitements of chasing chickens around, either to their roost or to slaughter, and the really exciting maneuvers that time. You assist Cuckoo, the chicken to escape the widow Witch’s cooking pot. Compete with your friends in this engaging game and let’s see how far away you can get Cuckoo from the witch. 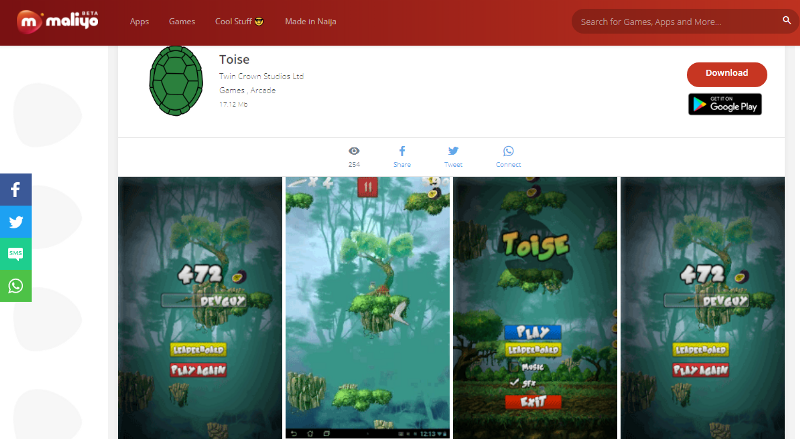 TOISE: This game brings back all the folktales you know very well of that Wise, mischievous creature; Tortoise. This App tests your knowledge of its tricks and mischief. You help maneuver the Tortoise through to the kingdom of the birds in his quest to search for food. TABLE SOCCER: You get to select your team of crown corks and take on the opposition. You can play against the computer or challenge your friends to play over blue-tooth. It comes with features such as Real-time multi-player game, an In-game store with an arsenal to help you beat your friends and built-in leader-boards to see how your stats stack up against your friends. You can get all these games and more on www.maliyo.com.